I need more succulents, pronto. Don’t we all? 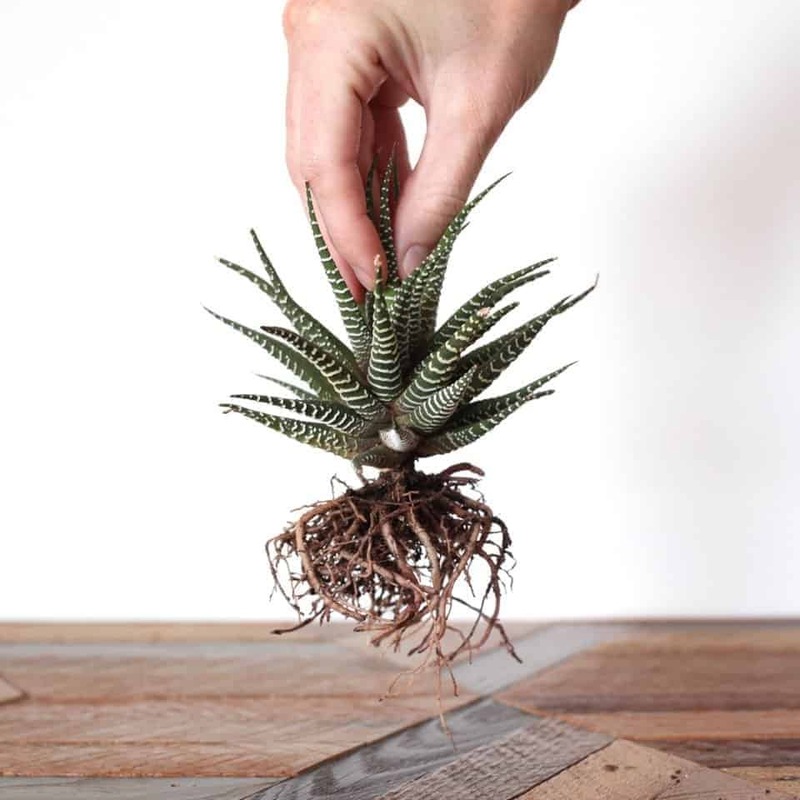 Your newfound succulent habit could start to get expensive if you had to go buy new plants every time you wanted to expand your collection. Fortunately for you, nature has taken care of that detail. While succulents can be grown from a seed produced by a flower, a much more common method of growing new succulents is through propagation. 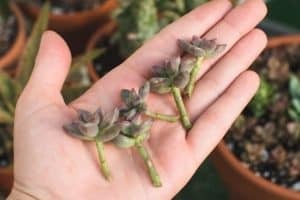 Succulents have evolved several different methods of asexual reproduction (that is, they make a genetically-identical clone of themselves) that are not found in most other plants. The easiest method of propagation is via the leaves. Simply select a healthy, mature leaf and pull it from the stem. Make sure that you do not break it off and leave a section of the leaf attached to the plant. Place the leaves that you pulled onto a tray or a dish and leave them in the sunlight next to their parent plant. You must wait 3-15 days for calluses to form on the ends of the leaf. A callus is like a scab for the plant – it prevents loss of water and invasion by diseases. It is imperative that the leaves receive no water during the callus formation process. This can lead to leaf rot, and will almost certainly halt the propagation process. Once the leaves have formed calluses, you should move them to a tray or pot that has dirt in it. The leaf can sense the dirt and will begin growing minuscule roots if it has not done so already. Make no attempt to bury your leaves. Leave them on the surface of the dirt, and the plant will do the rest. The leaves (or cuttings) should be misted or lightly watered daily to encourage growth, but do not saturate the soil. Once the plant has established itself (the formation of a rosette or new leaves), it can be re-potted and watering should be reduced. It is as simple as that! 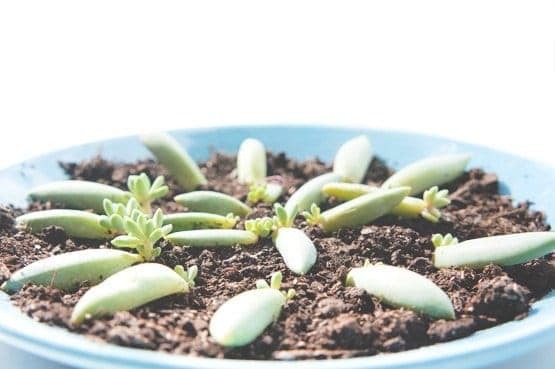 You should find that your baby succulents grow up within a few months or a year. Of course, as with all things in the natural world, there are exceptions. 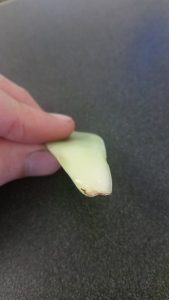 Some succulents will not propagate via this method. 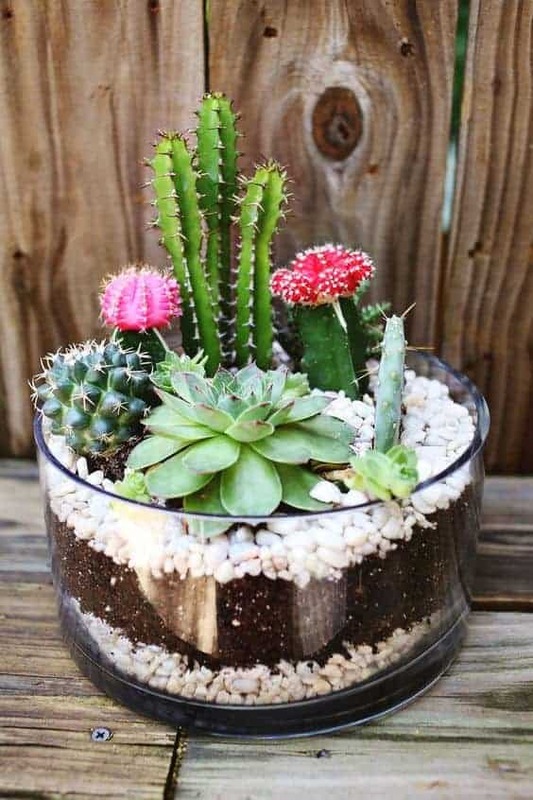 Notable examples would be Aloe or Agave plants. Pull off the leaves around the base of the stem until 1-2 inches are bare. Prepare those for propagation and set them aside. Use scissors or a knife to cut the stem as cleanly as possible – leave about 1/2 inch underneath the upper, still leafy, part. A clean cut is important because it makes it easier for the plant to callus. Take the top half, the rosette, and give it the same treatment as you did the leaves – leave it out to callus, then plant it in dirt. It should grow new roots in no time! This is a good technique to “get a new plant” if you cause etiolation while the plant is young. And that “stump” you left behind? Leave it! You should see it begins to sprout new buds within a few weeks! That’s three different methods of propagation in just one plant! That’s alright! This is a normal part of the process. 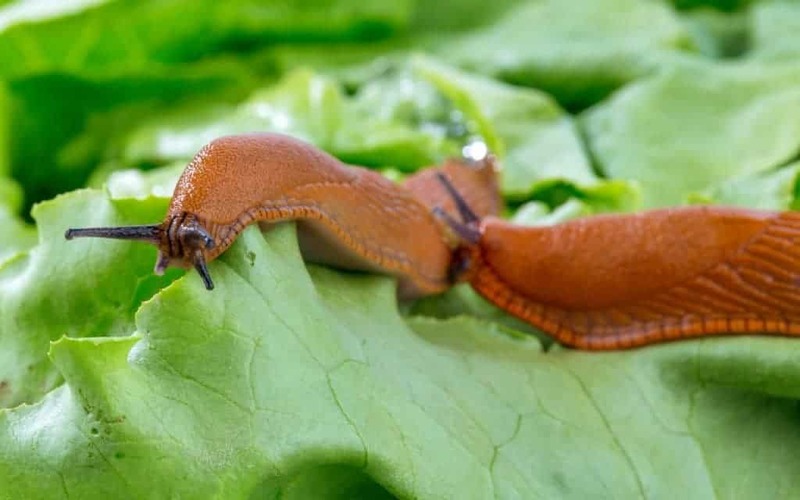 The success of leaf propagation is determined by a lot of factors – amount of sunlight received, proper callusing, when water was applied, soil presence, and so on. It is not uncommon to have a success rate of <50%. To improve these odds, rooting hormones are sometimes used. These are commercial products, often powders, that are applied to leaves/stems immediately after cutting to encourage callusing and subsequent root growth. They are effective in increasing success, but not as effective as having proper methodology. In lieu of buying a rooting hormone, honey has been shown to be effective. Simply dipping the tips of your leaves or stems in honey before setting them out to dry can increase their chances of survival. This is an excellent low-cost alternative, as most households have honey (because it literally never expires). If you choose to go this route, make sure you are using real, natural honey – not the artificial kind! Do you have any questions or comments about propagation? Tell us below! Is it possible to propagate all year round? It sure is, Joy! We recommend propagating indoors anyway, so the season shouldn’t affect your propagation. Good luck! 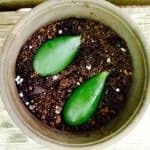 All succulents can be propagated with leaves or only some of them are capable to do so? I have certain varieties like black prince, echeveria elegance and some aeoniums. How to propagate them? Not all, but many can be propagated by leaves. The Echeverias you mentioned are a great candidate. Aeoniums, on the other hand, usually respond better to beheading and replanting the cutting. Is it normal for the leaves set out for callusing to lose their plumpness? It feels like they need water, but I know that’s not what I should do. It’s not uncommon. It seems to me that those ones are less likely to propagate, or take longer, than ones that remain plump. 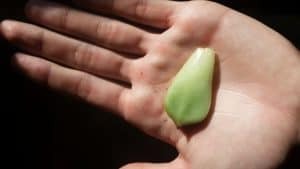 Why do they shrivel a little bit sometimes? Not sure. Maybe humidity, or problems in the callus forming process. Either way, water won’t help. They don’t have any roots to drink it with!! Thank you for answering my question! Now I have another. While the leaves are propagating, do you put them in the same kind of light they will want when eventually planted, such as an indirectly sunny but bright window? Pretty much all props should be in indirect light. They’re sensitive to sunburns and drying out. Windows make great places for props, in my experience. Do larger leaves result in larger babies? Not in my experience. They’ll be more robust, though. I have a question about the propagation method using cuttings. When they callused over you should stick them in dirt you write. When do I start watering them after I stuck them into the dirt? They only really need water once they’ve grown roots. It’s hard to know the status of roots when they’re buried (obviously), so I usually just wait a week or two and then start watering them because I assume some roots have shown up.